There are few things that unite Alaska gardeners more than the raised eyebrows we get when we tell someone we garden in the 49th state. Invariably it leads to "How can you stand the weather?" How can we stand the weather here? Really? This from the likes of Floridians and North Carolinians? And didn't I see that last Friday there were nighttime freeze warnings for Chicago and snow from the Dakotas to Wyoming? Please. They have no idea how warm it is getting up here. Things have certainly changed since I started writing this column so many years ago. We have added weeks onto our growing season. I am actually getting email questions from readers in the Lower 48 who are trying to figure out how to deal with the less temperate weather they are experiencing. Actually, what we need to figure out is how to use all this extra gardening time. I am using some of our unseasonable weather to be outside collecting seeds. Being a big believer in Darwin, I wanted to get the seeds from those last heirloom tomatoes, the ones that formed from late blossoms that surprisingly survived the cooler nights. And because of the extended season, our sweet peas are still going bonkers. These are hybrids, and their seeds won't necessarily produce plants that resemble their parents, but I want to see what we have nonetheless. What do you have that might be worth keeping its seed? Did you have any tomatoes that produced without use of a greenhouse? 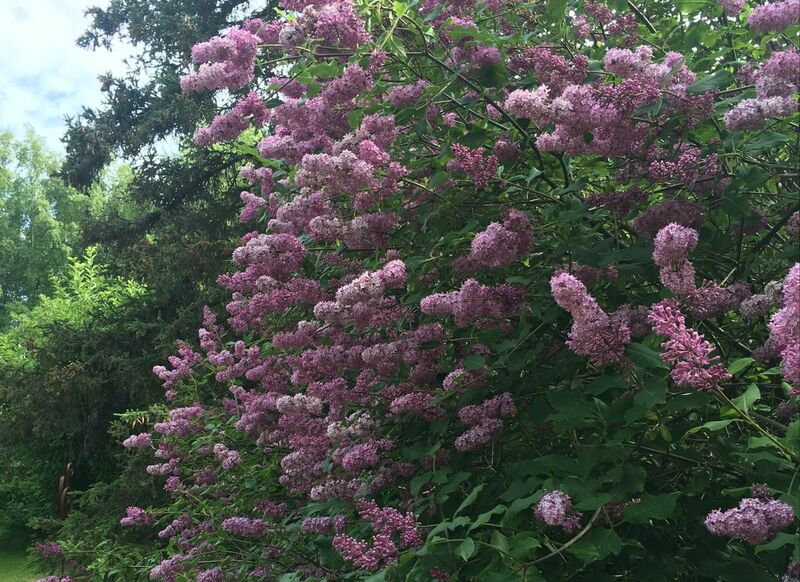 Next, several readers have commented on their lilacs bearing second blooms. This can be a thrilling experience, though it is not uncommon when there is an extended season. I don't want to rain on your parade, but you should enjoy these flowers as much as you can. They come from buds that were supposed to bloom next year. Now they won't, so expect a decrease in the number of blossoms you get next summer. And speaking of lilacs and trees, in this instance, is it OK to trim now so you can see out the window? (Two readers asked this week!) This is not the time of year to cut back lilacs or other bushes, nor trees. However, my answer to this question is that an Alaska view always trumps a plant blocking it. Go ahead and improve your view no matter the time of year. Just don't use it as an excuse to cut back anything else (except for spent raspberry canes, though these can wait until spring). Next, a few impatient readers have asked the right question about the traditional schedule for things that require a frost before they're brought inside. Cool weather makes for better potatoes as the sugars in the plant are transported to the roots, where they are stored as starch. The same thing applies dahlias. Brussels sprouts become much less bitter. I normally advise waiting for the frost because we don't have a long enough cool period for the necessary changes to occur in these plants. However, this year, it has been cool for long enough for plants to make the changes that used to require a frost. Besides, daylight is fading. You can still wait for a few hard frosts, but you don't have to. This year, you get the clearance from me to go out and finish your harvesting before we experience killing frosts. And finally, can we still plant trees now? Absolutely. The ground can still be worked. You can also still plant garlics and spring-flowering bulbs and bushes. Wow. This long-season gardening can get exhausting. I say bask in it. It is the middle of October and we are still gardening in Alaska. How can they stand the weather in Florida? Great cause: The Georgeson Botanical Garden in Fairbanks is responsible for Alaska's emerging peony industry because of the research done there. They are building what will be a fantastic peony promenade, a project worthy of our support (come on, legislators, give these guys the credit and help they deserve for what they have done!). You can help with a donation check made out to the Georgeson Botanical Garden Society and mailed to P.O. Box 81777, Fairbanks 99708, or go to the website. For more information, gbgsociety@gmail.com or 907-841-4907. Amaryllis: Do you know where yours are? Now is the time to put bulbs into dormancy. Turn pots on their sides and leave in a dark, cool spot until mid-December.